Are you looking for an aerial lift job and need some help? CertifyMeOnline.net, the #1 source of online OSHA aerial lift training, is the perfect place to start! Our training courses are developed by OSHA experts, so you’ll always have the most up-to-date and useful safety training on your record. Without aerial lift certification, finding the best aerial lift operator jobs is nearly impossible. Any firm hiring for aerial lift operators (or scissor lift workers) isn’t willing to take on the massive liability that comes with hiring improperly trained employees. If you’re in the market for lift operator jobs, begin your career course with the most comprehensive online OSHA aerial lift training – CertifyMeOnline.net! What Do Aerial Lift Jobs Involve? Aerial lifts and scissor lifts are used throughout cities, small towns, and rural areas alike. With their incredible sizes and reach capabilities, lifts are used for accessing and repairing utility lines, maintaining structures and building structures, cleaning and maintaining aircrafts, washing and installing windows, fulfilling tree care work, installing the lighting, sound equipment and structural foundation for music venues and other special events, and much more. 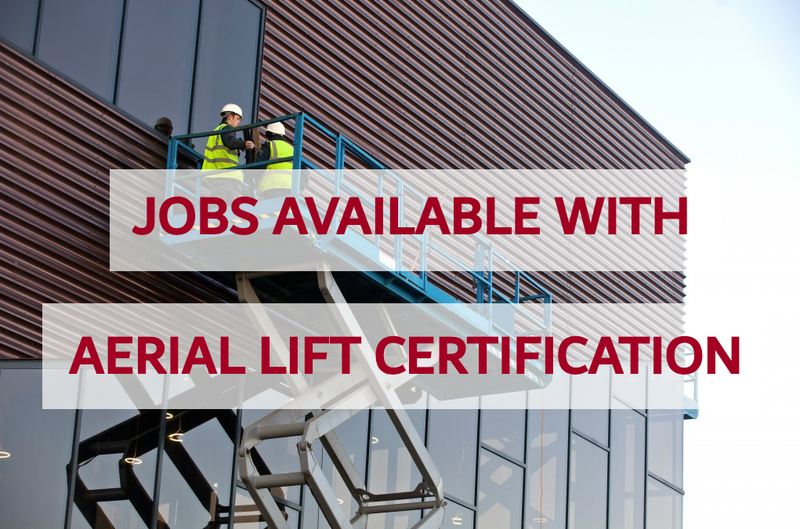 What Aerial Lift Operator Jobs Are Available with Aerial Lift Certification? Are Aerial Lift Jobs in my Area? Aerial lift and boom lift jobs are always in demand. From construction sites to heavy equipment rigging, from dockyards to specialized repair work, aerial lift operators with the latest OSHA safety training have the best chance to obtain well-paying jobs. With thorough training from CMO, you can create a financially rewarding career out of operating aerial lifts! You can apply for aerial lift operator jobs in all major U.S. metro areas, including New York City, Los Angeles, Chicago and many other cities. And that’s not all – smaller towns and communities also have many great jobs for those with aerial lift certification for the taking. But remember – only the top candidates get those jobs. That’s why receiving your aerial lift certification is critical when applying for lift operator jobs! Employers are simply more willing to hire open positions with applicants that have OSHA compliant aerial lift certification. Aerial lifts are tightly regulated by the Occupational Health and Safety Administration (OSHA). Also in common with forklifts, aerial lifts have a poor safety record. An average of 26 construction workers lose their lives each year as a result of an aerial lift accident. Many of these accidents can be prevented with proper training and certification. For this reason, getting a job working on an aerial lift will be much easier if you show up on prospective employers’ doorsteps already trained and certified. You will still need to undergo hands-on, site-specific and equipment evaluations, but if you can show that you have undergone the classroom phase of aerial lift training, you will have an advantage over those applicants who show up empty-handed in this respect. CertifyMeOnline now offers online aerial lift and scissor lift training. Identifying vacancies for aerial lift work is easy. Within a few mouse clicks on Google or another search engine, you can find yourself combing through dozens of promising opportunities. Indeed is a great resource for finding job listings. You can also ask local residents in the area and read local newspapers. The nice thing about being trained and certified for aerial lift work is you can pretty much find work anywhere you choose. How Do I Qualify for Aerial Lift Jobs? As we mentioned earlier, the key to getting aerial lift jobs is to complete training and receive your aerial lift certification. Some aerial lift operator job descriptions may not specify that you need to already have completed training, and they will most likely train you on the job. However, other aerial lift jobs will want you to have been trained and certified to prove you are already capable of operating lifts safely and efficiently. Whether you’re seeking training for yourself, or you will be completing training on the job, you can find exactly what you and employers need at CertifyMeOnline.net. Our training is all online and accessible 24/7 from any device with an internet connection. It will help you qualify for various aerial lift operator jobs in your area. Learn more about it below! Sign Up with CertifyMeOnline.net Today to Meet the Aerial Lift Operator Job Description for Your Dream Jobs! CMO offers the best aerial lift training available anywhere. Our pricing structure is very affordable – much more budget-friendly than hiring a 3rd party OSHA training coordinator. We’ve helped companies just like yours become OSHA compliant with our Fall Protection, Train the Trainer, Class 7 Vehicle, and Aerial Lift / Scissor Lift training classes. Plus, our courses are available in Spanish as well! In only about one hour, new operators can complete their training and qualify for the best aerial lift jobs! To get started today, please call us at (602) 277-0615, or email our OSHA aerial lift training experts today at info@certifymeonline.net. We look forward to hearing from you!